A tad late for GBBD, I know. But it's been cold and dreary with inhospitable freezing rain. So spending any time outside right now is a chore. But here goes my rundown of what's managed to hang on bloom-wise. Above, the intrepid rosemary, unknown variety. I haven't met a rosemary I didn't like, and this is one more proof of why. Through rain, sleet, snow, humidity, drought,...it never stops. And it blooms 3/4ths of the year! 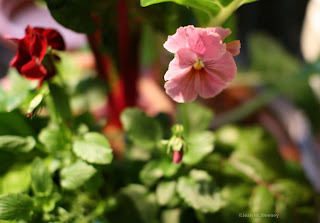 And what about this pink geranium that sits outside in a pot all year long and never gets any protection from the freezes? I love these little pansies - Imperial Antique Shades. 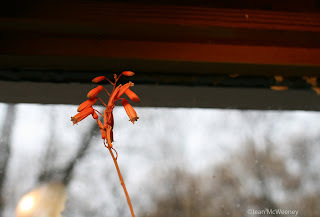 Lizard Lips aloe is blooming in the store room. It blooms constantly. Though they're small, they're very cute. Though this isn't a bloom, I had to show off my one and only Meyer lemon that's about ready to eat. I repotted this tree last year so I think that's why I only had one lemon. The year before I had nine lemons at Christmas time so I made lemon marmalade as gifts. But in September, after all the rain we had from hurricanes, it put on a show of blooms and I once again have nine little lemons, about the size of little pecans right now. I still have a few rose blooms. This is an unknown red variety, probably Cramoisi Superior or Louis Phillipe. 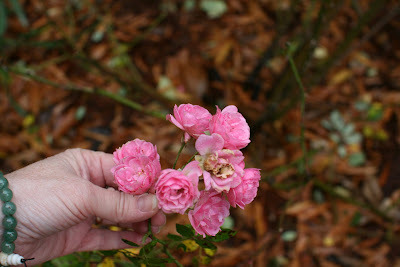 And this is the Fairy, a first year rose for me and so far, very hardy. I was also going to post about the 6 foot tall bloom from my Pancake succulent. It's been blooming for months but it's so hard to take a picture of it. Maybe I'll try a post on it later. The roses are so pretty. And I love the Lizard Lips. I'm not familiar with it but it is very attractive. 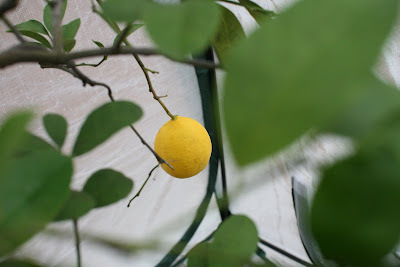 I think a Meyer lemon should totally count on bloom day!! I don't have a Meyer yet. I must get one soon. Hi Jan, it is raining here too and your wet blooms look right at home here. I agree with you about the rosemary, never met one I didn't like. 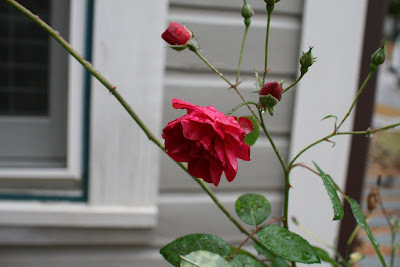 Love all your tough ones, like a geranium that just won't die and roses that keep on giving. We have fairy queen, a dark red/pink sport of the fairy, a blooming machine. Happy bloom day, even late, still a joy. Ooops, left out the *e*, Jean, not Jan! Oh for heaven's sake. When it rains it pours. Hi Jean.Thanks for visiting my blog and I appreciate your comments. I wish you much success in your new start and in looking at your blog, you've certainly hit the ground running. Look forward to reading more. I like visiting these southern gardens on bloom day, reminds me that flowers are still blooming someplace! Meyer lemons are much sweeter and thinner skinned than regular lemons. They are much yummier (if such a sour thing can be yummy)! I don't know how I missed this post of yours...but better late than never, right? I admire all of your blooms for Dec bloom-day. 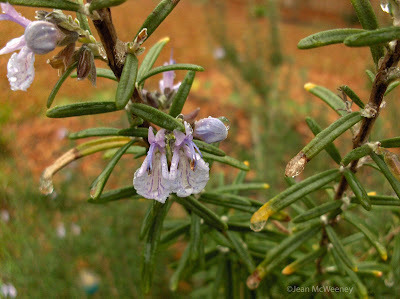 The Rosemary is something I haven't had luck with; perhaps I should research different varieties...maybe there is one that would survive all seasons in my area. 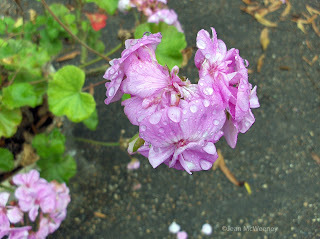 I want a perennial geranium too-I like the color of yours!